Woohoo! I've finished a quilt on the very first day of the year! Surely that's good luck? 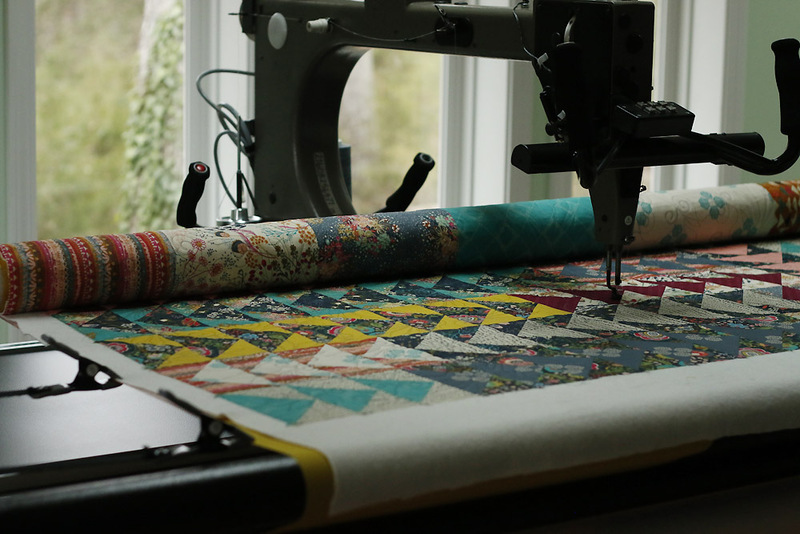 Today I finished quilting my Indie Geese quilt on our longarm quilting machine. I bound it in quilt-back trimmings with my favorite and super quick zigzag machine binding. Here it is! My goodness were there hiccups: broken threads, wrong turns, relocating, relocating. I think I consulted the manual about 4 times and YouTube 3 times. So, I didn't get it done the most efficient way, but I did get it done. Fortunately, the machine is very patient and my snail's pace doesn't effect the outcome. The stitches are all so beautiful, with lovely, secure tension. 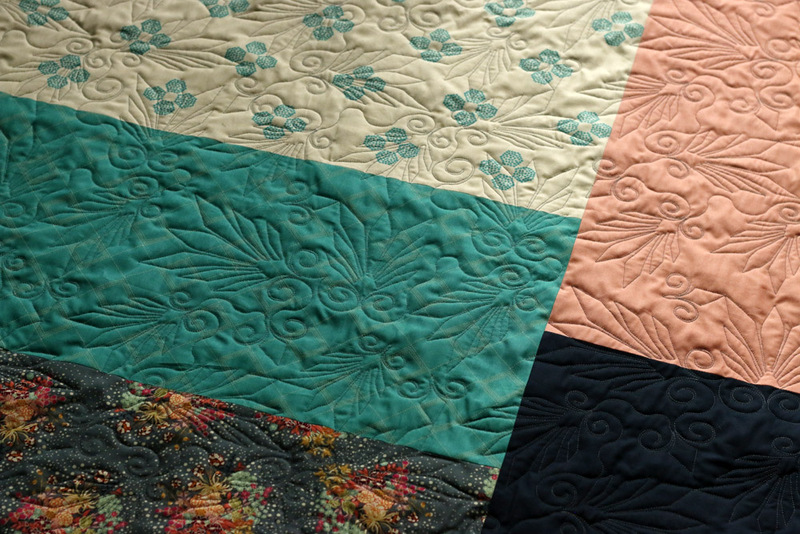 Combined with machine applied binding, this type of quilting will make for such a durable quilt! I chose an edge to edge quilting design called Greece, which I've since included in our pattern catalog. It shows up best on the quilt back over the solids. The swirls and points remind me of the Indie Folk fabrics. Since I don't yet have the skill to freehand a pattern this complex, it was especially exciting to see it come to life to compliment this quilt. I made this quilt entirely of Art Gallery fabrics: Pat Bravo's Indie Folk and Pure Elements solids. Even the backing! I wanted to see how a quilt made 100% of Art Gallery would feel. To me it seems slightly lighter than usual and a little crisp, with a lovely luster. I expect the crispness will soften with washing. Indie Geese is now listed in my Handmades shop. It's a quite generous throw quilt, measuring 60 x 69". I like to make my throws big enough for two to cuddle. I hope this first quilt of 2018 will soon find itself a happy new home. Here's to a quilty 2018!